Arnie Gundersen, nuclear physicist, discusses Fukushima and how Americans can put pressure on the Japanese to allow international experts to step in. 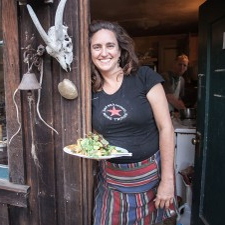 Carin McKay joins us to celebrate the power of sharing food in community and her beautiful new cookbook Culinary Magic at The Regenerative Design Institute. Music by: The Eagles, Alexandra Ottaway, Blackfire w/Cyril Neville, Baba Brooks, and Laura Nyro.